District 1 – Three teams are still in the running for two playoff spots in District 1. Nemaha Central clinches the district title with a win at Hiawatha. Meanwhile, Hiawatha can clinch a playoff spot by upsetting the Thunder by 18 or more points. Sabetha is in with a win at Riverside. Riverside is eliminated because even with a win over Sabetha and a Hiawatha loss, the Cyclones can finish no better than -13 in margin points while Sabetha can finish no worse than -6. District 2 – Maur Hill-Mount Academy has clinched the District 2 championship with wins over Pleasant Ridge and Immaculata-Maranatha. The Rams and the Raiders will meet this week with the winner qualifying as the district runner-up. District 3 – Silver Lake, Perry-Lecompton and Royal Valley are all still capable of qualifying for the two playoff spots out of District 3. Silver Lake is the district champion with a win over Royal Valley. Similarly, Royal Valley claims the title by upsetting Silver Lake coupled with a Perry-Lecompton loss to Oskaloosa. Perry-Lecompton can clinch a playoff spot with a 3-point win over Oskaloosa. District 4 – Rossville clinches the district with a win over Council Grove. Council Grove can claim the title with a win over Rossville coupled with a Mission Valley loss to St. Marys. Mission Valley clinches a playoff spot with a win and a Rossville win. District 5 – Wellsville has clinched the District 5 championship with wins over Osage City and West Franklin. The Indians and the Falcons will meet this week to decide the district runner-up spot. District 6 – Unbeaten Jayhawk-Linn has clinched a playoff spot as the Jayhawks can finish no worse than second in marginal points despite a big loss this week. Erie can clinch the district title with a win and Humboldt loss to Northeast-Arma. Humboldt qualifies for the playoffs with a win and an Erie loss to Jayhawk-Linn. District 7 – CNC members Galena and Riverton have each qualified for the playoffs out of District 7. The Bulldogs will make the 4-mile trip to Riverton this week with the winner claiming the district championship and the loser qualifying as the runner-up. District 8 – Fredonia will visit Caney Valley with the District 8 championship and the Tri-Valley League title on the line. The game has been voted the Kpreps Fan’s Choice for Game of the Week. Both teams have already qualified for the playoffs, and both are 6-0 in TVL play. Fredonia has qualified for the playoffs for the first time since 2006. District 9 – Still a lot to be decided in District 9 where all four teams have two wins each. Independent is the district champion with a win over Belle Plaine, while the Dragons get the title with a win and a Douglass loss. Douglass qualifies as the runner-up with a win and an Independent win. Even with a win over Douglass coupled with a Belle Plaine loss, Bluestem cannot finish in the top two among district margin points and has thus been eliminated. District 10 – Conway Springs, Garden Plain, and Chaparral are still alive for the two playoff spots out of District 10. The Cardinals play at Chaparral this week, while Garden Plain travels to Cheney. Conway Springs is the district champion with a win, while Chaparral claims the title with a win and a Garden Plain loss. Chaparral can also clinch the district title by beating Conway Springs by at least 16 points, and secure at least a playoff spot with a 5-point win. Garden Plain can secure a playoff spot with at least a 15-point win. District 11 – Sterling and Halstead have already qualified for the two playoff spots. The Black Bears and Dragons will meet in Halstead with the winner getting the district championship and the loser the runner-up spot. District 12 – There is still a lot to be decided in District 12, although Hesston looks well-positioned for a district title and can secure it by beating Marion. The Swathers can also fall completely out of the playoffs with a loss of 15 or more points to Marion coupled with a Southeast of Saline win by two or more points. Southeast of Saline can clinch a playoff spot by beating Hillsboro by 8 points or more. Marion can qualify for the playoffs by beating Hesston by 15 or more points. The Warriors can claim the district championship with a win over Hesston and a Southeast of Saline loss to Hillsboro. Hillsboro has been eliminated as even with a win and a Marion loss, they cannot finish in the top two in marginal district points. District 13 – Riley County and Marysville will be the two playoff teams from District 13. The Falcons and Bulldogs will meet at Riley County with the winner qualifying as the district champion and the loser as the runner-up. District 14 – Phillipsburg has already clinched the district championship after beating Norton and Thomas More Prep. Norton and TMP will meet in Hays with the winner qualifying as the District 14 runner-up. District 15 – Top-ranked Hoisington has clinched the District 15 title ahead of their trip to Lyons this week. Larned will travel to Ellsworth with the winner reaching the playoffs as the district runner-up. District 16 –Cimarron has clinched a playoff spot because even should the BlueJays lose by 21 points to Southwestern Heights this week they can finish no worse than the top two in margin district points. Lakin clinches a playoff spot with a win by at least 10 points over Syracuse this week. Syracuse can get in the playoffs with at least a 19-point win over Lakin coupled with a Southwestern Heights loss to Cimarron. Southwestern Heights can claim the district title with a win and a Lakin loss. District 1 – Troy has clinched the district championship after defeating Jefferson Co. North 38-12 last week. Jefferson Co. North will qualify as the runner-up with a win at McLouth. A McLouth win would create a three-way tie between the Bulldogs, Jeff Co. North, and Doniphan West. If that occurs district marginal points will be used to determine the runner-up. Doniphan West has finished district play and cannot improve on its -13 in marginal district points. As a result, the Mustangs have been eliminated. McLouth must defeat Jeff Co. North by 9 or more points to qualify as the runner-up. District 2 – Valley Heights will host Washington County with the District 2 championship on the line. The Mustangs and Tigers have both already qualified for the 2-1A playoffs. The winner of this week’s game will advance as the district champion, while the loser advances as the runner-up. District 3 – Lyndon (2-0) is in great position to win the District 3 title with wins over Chase County and Northern Heights. The Tigers travel to Olpe this week. Olpe can win the district championship by beating Lyndon by 10 or more points. Chase County claims the runner-up spot with a win and a Lyndon victory over Olpe. Northern Heights has been eliminated as even with a win and an Olpe loss, the Wildcats can finish no better than -21 in district margin points. Olpe can finish no worse than -7. District 4 – St. Mary’s Colgan has clinched the District 4 title with wins over Yates Center and Oswego. The runner-up spot will be filled by the winner of Yates Center and Oswego this week. 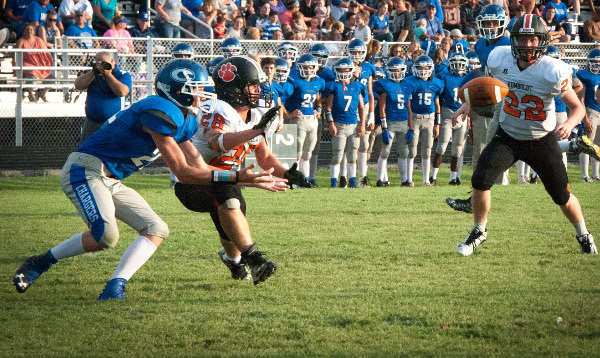 District 5 – Sedgwick has clinched a playoff spot by virtue of their 3-0 start in district play. The Cardinals travel to Inman (2-1) and can win the district title with a victory. Inman can also win the district title by beating the Cardinals, but a Teuton loss along with a Whitewater-Remington victory over Medicine Lodge means Moundridge will claim the runner-up spot. Moundridge has completed district play at 2-2 and with a favorable +18 in marginal points. District 6 – Smith Center has claimed the District 6 championship with wins over Sacred Heart and Republic County. The runner-up spot will be decided by the winner of Republic County at Sacred Heart. District 7 – Plainville will travel to La Crosse in a game that will decide both playoff spots in District 7. The winner will advance as the champion, while the loser qualifies as the runner-up. District 8 – Meade is the District 8 champion with wins over Elkhart and Stanton County. The winner of Elkhart at Stanton County this week qualifies as the district runner-up.